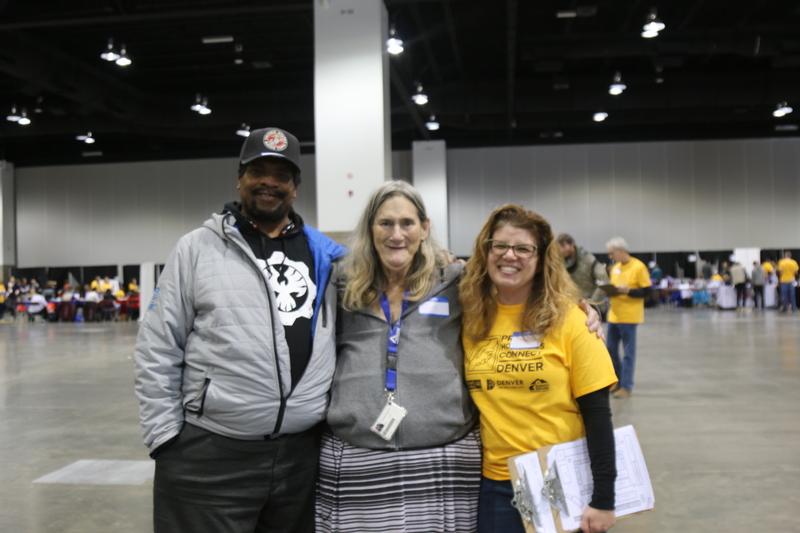 On Thursday, November 15, 2018, 750 volunteers and 1,400 people living in our community made a connection with one another at the Colorado Convention Center at Project Homeless Connect. This is an event that brings together over 100 resource providers and volunteers from the community to help those individuals experiencing homelessness and housing instability connect with resources that give them access to basic necessities. There are 300,000 people living in poverty in Metro Denver. The increasing cost of living in this area is forcing families to make almost impossible decisions. That’s an almost unimaginable place to be for most people. And when this happens, it’s not easy to get back to where you once were, without help. Most people living in poverty in Metro Denver aren’t able to easily access stable housing, quality child care and education, or jobs to support their families. This doesn’t just have an effect on your physical well-being, this can have an effect on your mental and emotional well-being. To go from financial security to not being able to provide for yourself and those in your care isn’t an easy transition. “I didn’t feel like coming here, but I’m glad I did. I got so much help here. I met someone in the service, like me, who was in the same area at a different time. He told me when it gets real cold to call him up and he’ll get me off the streets for a while. And then, I met a friend of mine who’s the veteran coordinator at the Samaritan House. I was in their program a year ago. She asked me, ‘do you have any more referrals?’ I said, ‘I don’t know.’ So my volunteer buddy and I went to the veteran’s booth and they said that I had two more referrals for transitional housing, so I can get off of the streets and get my life back together. Now, I’m going to get into a place a get a job in the end,” one attendee said. This is why Mile High United Way partners with Denver’s Road Home, as well as the city of Denver, each year to host Project Homeless Connect at the downtown Colorado Convention Center. Since the center is located in the heart of downtown, it helps to remove the barriers of time and transportation for most people experiencing homelessness. In addition to on-the-spot employment, health checks, and other basic services, this event connects each individual with a volunteer who walks them around the event space to help them find the exact services they’re looking for. Having that person paired up with them means more to some than anything else they experience that day. To have someone decide to spend their day with them without judgment is a gift that can’t be put into words. Giving back is a tangible theme at Project Homeless Connect for everyone involved. Agencies are taking time to share their resources with the community. Volunteers are taking the day to connect with someone in the community who they might not have otherwise. Individuals from the community, even though they’re receiving on this day, are also willing to give back what little they have.